Determination of forces in geo-reinforcements is performed by splitting and assigning the calculated earth pressure to individual layers. Each reinforcement accommodates part of the active pressure, which acts in the corresponding layer, i.e. force developed in the reinforcement Fx = ΣTa,hor. Shape of slip surface depends on selected standard of calculation. Earth pressure is considered as an active for extensible reinforcements, or as a combination of pressures for inextensible reinforcements. 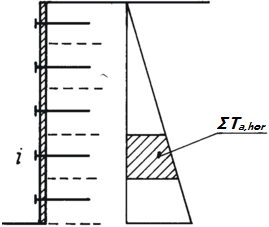 Verification of bearing capacity of reinforcement against pull-out can be carried out according to the factor of safety or the theory of limit states.